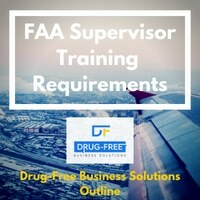 The Federal Aviation Administration (FAA) requires drug and alcohol training for safety-sensitive employees and supervisors who will make reasonable suspicion testing decisions. That training must meet certain requirements. We provide summaries of those requirements below. Supervisors must receive both education and training. The FAA drug and alcohol education and training requirements are listed in 14 CFR Part 120.115. Learn the details fast with our summary. Learn the drug and alcohol training requirements for employees covered by the FAA. The requirements are explained in 14 CFR Part 120.115, and we summarize the regulation here.